This summer I decided to leave the rainy season in Mexico City behind for a bit of sunshine in Europe. 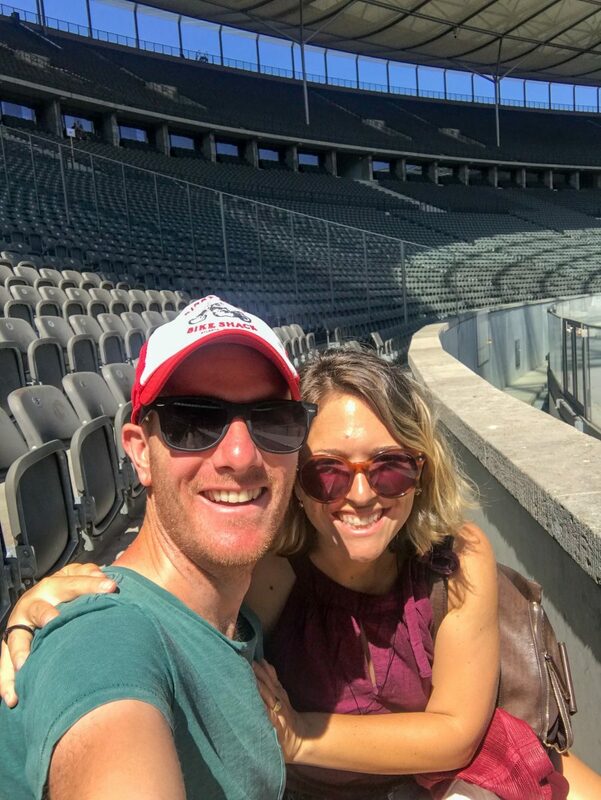 Both Luke (my boyfriend) and I wanted to celebrate turning the big 3-0 with a bang, so we saved up and have now been exploring Berlin, Northern Italy, and the UK for almost two months! I am such a sun creature, so I was really excited to get to Germany in July and enjoy the sweltering sunshine and almost completely cloudless skies. 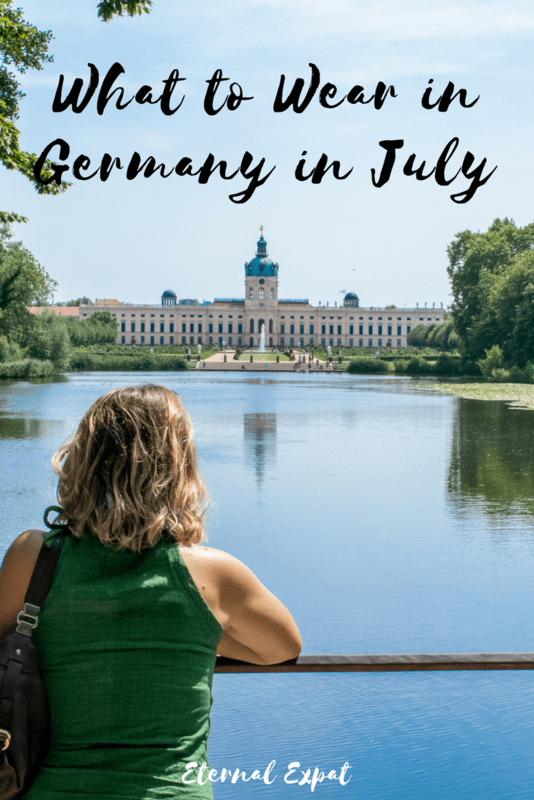 While my July trip to Germany only took me to Berlin, a little research has allowed me to see that the country experiences pretty much the same weather throughout July no matter which part you visit. That being said, this year (summer 2018), temperatures across the Northern Hemisphere have been WAY higher than usual. Even the UK is having hot, humid, and almost entirely sunny days, so my trip to Germany brought with it, incredibly high temperatures. July in most of Germany usually means highs of 77 Fahrenheit or 25 Celsius. While that doesn’t sound too hot, it can be quite humid and when the sun is shining, it has a serious strength. It’s well worth checking the temperatures the week before your trip just to be sure. It can sometimes reach highs of over 85 Fahrenheit or about 30 Celsius. In the evenings, it mostly stayed warm. There were some threats of rain and I’ve been told that German summers usually include some evening thunderstorms because of all of that humidity, so pack a very light rain jacket and an umbrella just in case. I packed a thin cardigan for cool evenings, but never ended up using it. Germany is a pretty liberal country. After living in Mexico for two years, where women in particular are a bit more conservative, it was nice to be able to wear pretty much what I wanted without being stared at or wolf-whistled! I saw plenty of tourists and locals wearing short-shorts, low cut tops, tank tops, mini skirts and dress, flip-flops, and belly shirts. I am a big lover of jean shorts. I have two pairs that I absolutely love and take with me everywhere. I love them because they’re mostly lightweight, they match with everything, they’re comfortable, and they still manage to make me feel stylish without taking too much time to get dressed in the mornings (the less hassle the better is kind of my favorite thing, especially when I’m traveling). I usually just make my jean shorts out of old jeans that have started to fade too much or have worn out in the thighs. I even have a pair that I’ve made from my boyfriend’s old jeans. If you’re not into that or you don’t have a pair of jeans that you want to cut up, I love Madewell jean shorts. They always have a variety of sizes, cuts, and washes and their denim is really great quality. They’re not the cheapest option, but they’ll last such a long time. If you want a cheaper option that will get you through your trip, Forever 21 usually has plenty of jean short options on their website. 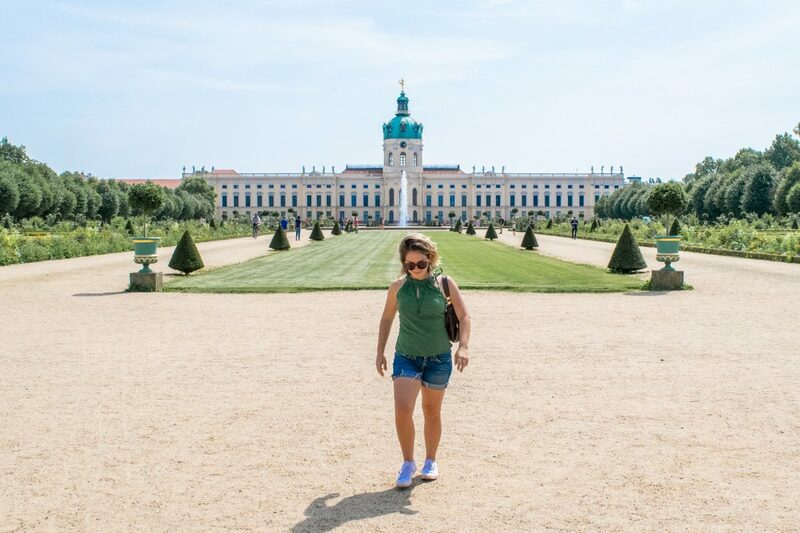 Trying to look casual and cool in front of the Charlottenburg Palace in one of my go-to summer travel outfits. Like I mentioned above, the sun in Germany in July is H-O-T. That means black is not a great idea unless you literally want to feel like you are in the sun. I recommend in general, choosing light colored shirts and dresses to keep cool and to avoid any sweat stains. I love white, cream, and pale pink when I’m traveling in the summertime because it low-key does not shout to the world that you have back sweat and it doesn’t attract the sun as much as darker colors do. Some of my favorite places to get dresses for summer trips are Asos (this one is SO PERFECT), H&M (where I got this cute Bardot dress), and from thrift shops where you can grab pieces that no one else has! 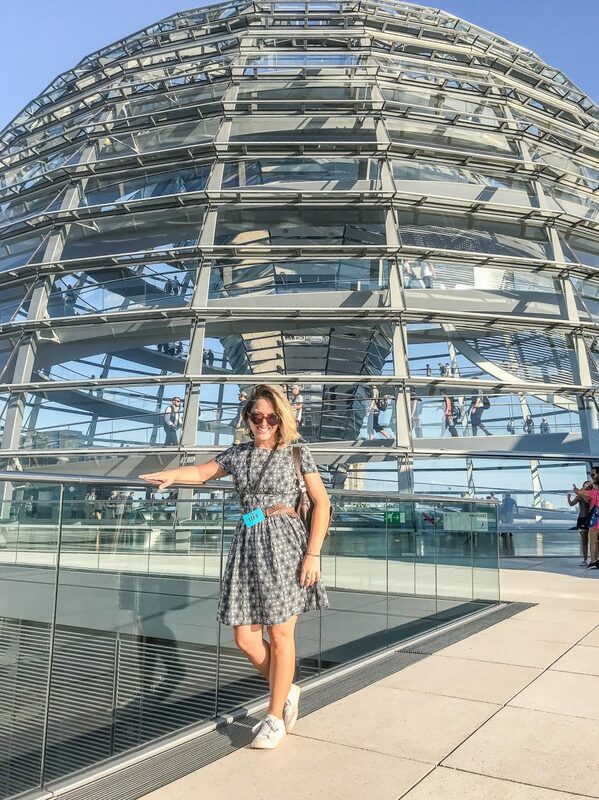 This was one of the hottest days in Berlin that we experienced and I was so glad to have this lightweight dress on! Another must for packing for any European summer destination. I’m a huge lover of linen. Ever since I picked up a few great tops in Bali a few years ago (the green and maroon ones you see in some of these pictures), I’ve learned that lightweight linen shirts are perfect for traveling during the hot summer months (or anywhere hot throughout the year, like Mexico!). I usually pick up cute linen shirts from different thrift stores whenever I can. The louder the prints and colors, the better for vacation (you better believe I will wear bright pink floral shirts and I don’t even need to be on vacation!). I do try to stick to light colors though, just to make sure I don’t get too hot. 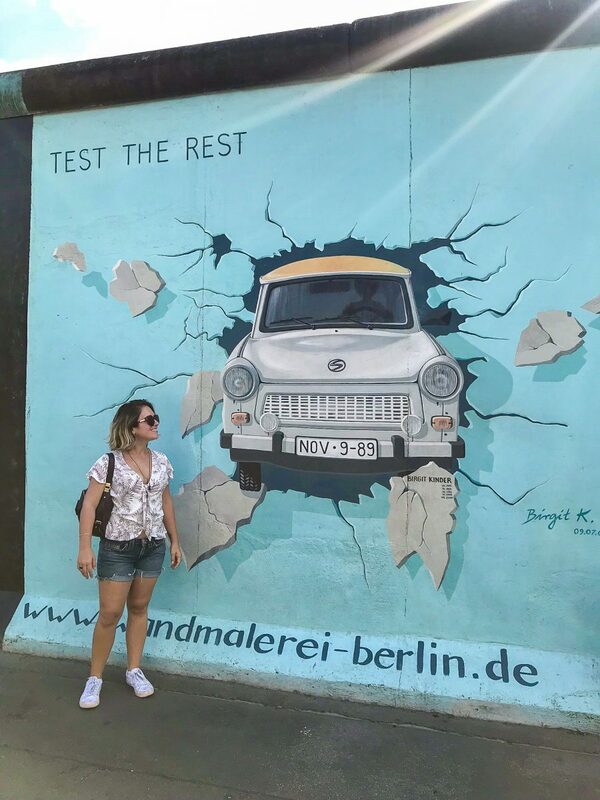 A light colored shirt and my fave jean shorts in front of the Berlin wall! Touring around a European city usually means lots of walking on cobbled and uneven streets and sidewalks. While German cities are well connected with trams, buses and often subway and train networks, you’ll still likely do a ton of walking around museums and neighborhoods. Longtime readers will know I’m a huge lover of Rainbow Flip Flops. They are super comfortable and come in tons of different colors and styles. They are leather flip flops with good arch support and you can walk in them for hours and hours. You can’t help but notice that Birkenstock sandals are everywhere in Germany, and so they should be, they’re a German company. I’m not a huge lover of the chunky sandal, but they do have a ton of different styles these days. They also come in cool colors and patterns and they are seriously comfortable. I’ve also recently realized how cute a pair of sneakers can be with jean shorts and dresses. Two of my current favorites are Vans and Converse. Choose colors that go with most things like white (although I learned the hard way that these get VERY dirty when traveling in cities), grey, black, or navy blue. This was a lesson I had to learn the hard way (thankfully my boyfriend packed two hats). The sun in Germany in July is strong and if you have dark hair like I do, you’ll want to have a hat. I wore a regular trucker-style baseball cap, but of course you should probably plan ahead and avoid my silly mistake. Pack a hat that will go with all of your outfits and that you feel comfortable wearing in both countryside and city. 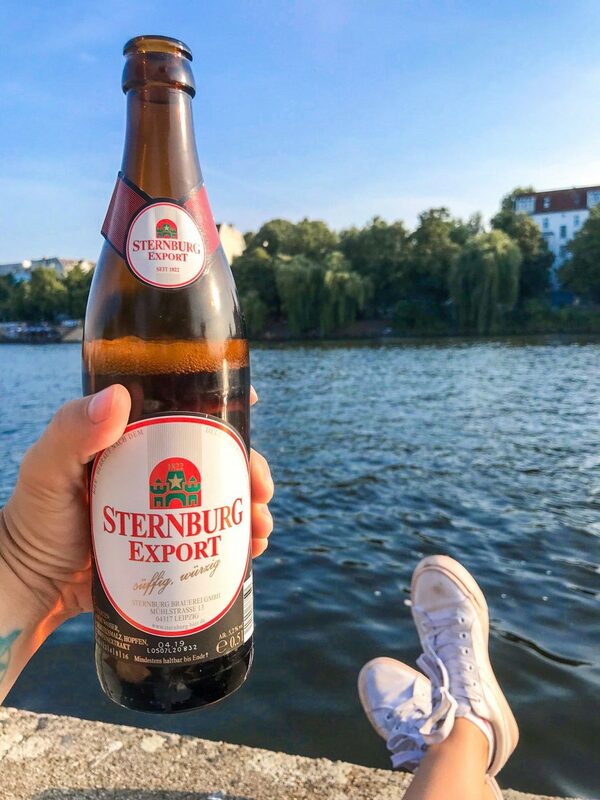 Chilling along the Spree in Berlin in my sneakers after a long day of walking with the cheapest beer you can buy in the grocery store! Another must during summer in Germany. I try to avoid using chemical sunscreens and have tried a few different ones. My current favorite is the Badger Zinc sunscreen. The small size is a carry-on size at just under 100ml, but it lasts SO LONG because you only need a very small amount. You definitely can’t leave home without your sunglasses. While I was in Germany in July, it was clear blue skies every single day of the eight days I was there. I didn’t really see any cheap shops where you could pick up a pair of sunglasses, so if you do forget a pair, you’ll have to head to a mall to grab yourself a pair (all that to say, don’t forget yours! ).